6. Elvis Pez- The Good! For my recent birthday, I had the extreme pleasure of seeing the Elvis Birthday Tribute Artist Spectacular, which is another story in and of itself (should I ever start elvistributeartistmonthly.com, I will surely post a recap there). But hours before going, a UPS deliveryman arrived with a very special gift: a Giant Elvis Pez that I had ordered off of eBay. Now, this was a marvelous coincidence, because I had ordered Giant Elvis before learning that I would be going to the Elvis tribute artist concert! So the evening kicked off on a great note. And actually, the evening also ended on a great note. 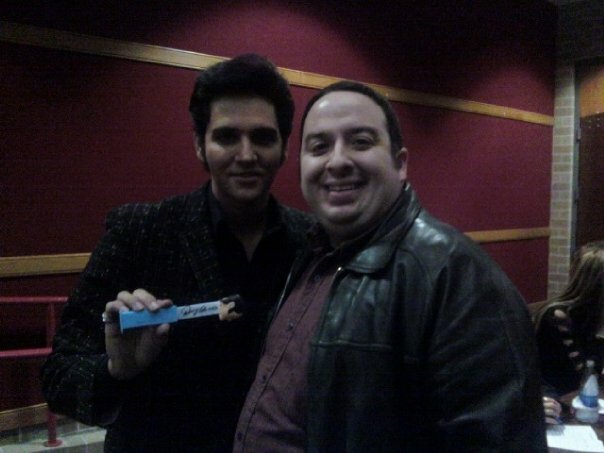 After the concert, I got to meet one of the Elvis tribute artists who performed. His name was Donny Edwards, and he really had the looks and the moves of the King of Rock n' Roll. He was signing autographs, and after waiting patiently in line for a few minutes I got my chance to say hello. And, I happened to have in my pocket a Sharpie and an Elvis Pez dispenser! I asked him to sign the inside sleeve of the dispenser. It was clearly the first time anyone had asked him to sign a Pez dispenser! And here is a closer look at the signed Pez dispenser, which will have a special place on my shelf. 7. Elvis Pez- The Bad! Halloween 2008: The evening started out innocently enough. 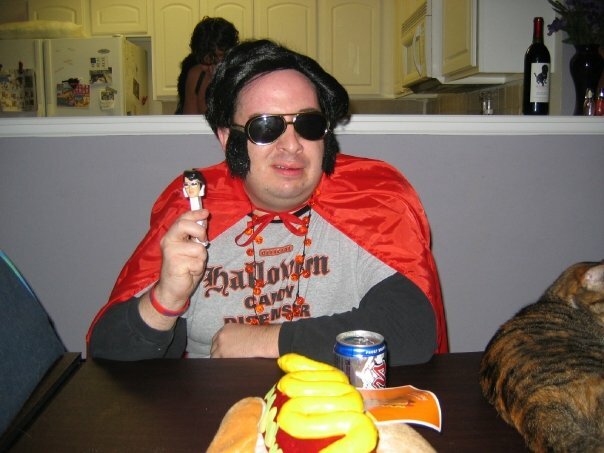 Dressed in an Elvis wig, sunglasses with built-in sideburns, a cape, and a t-shirt that read "Official Halloween Candy Dispenser," my costume was, you guessed it, Elvis Pezley. 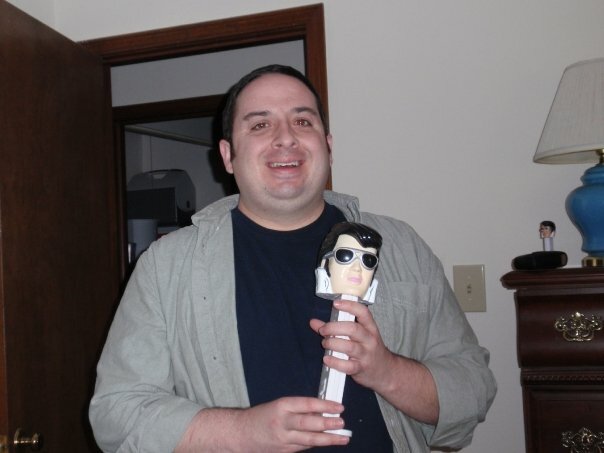 The defining prop for this costume was the 70s Elvis Pez dispenser. Nice picture, eh? Well, alas, the story takes a downward turn from here. Perhaps because I really wanted to stay in character, I consumed a rather inordinate amount of alcohol. I started before the first party and continued through that party. By the time we got to the second party, well, I was in pretty rough shape. In fact I had drank enough at the first party to keep me rolling through the rest of the night. It was somewhere on the drive home, when my buzz was beginning to wear off, that I noticed something important was missing- yes, it was my Elvis Pez! What was worse, I had absolutely no clue where I had left it. The horror, the horror! This story does have a happy ending. 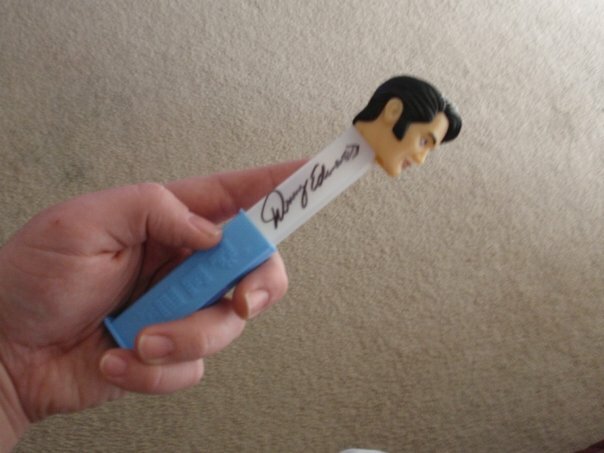 I was able to get a new Elvis Pez off of eBay, and have once again restored balance and order to my Pez collection. As for the first 70s Elvis, I will always remember the good times we had. Well, most of them, anyway. but an Obama Pez dispenser?? When I learned about this one, I ordered it right away. It's Pez we can believe in! Hail to the Chief, and while you're at it, flip me some Pez. Times are few and far between when restaurants or stores have Pez promotions. Past examples include Jack-In-The-Box, Walgreens, and Wal-Mart. So it was with great enthusiasm that I learned that Chick-Fil-A was coming out with their own dispensers, available only in their restaurants. Almost immediately upon hearing the news, I raced over to my local Chick-Fil-A, only to learn that they did not have any in stock yet. I think the cashier could read the dejection all over my face, because she asked for my name and number. A couple of weeks later, I got that magical call. That day, at lunch, you best believe I stopped by Chick-Fil-A. And you best believe I got my Chick-Fil-A dispenser. 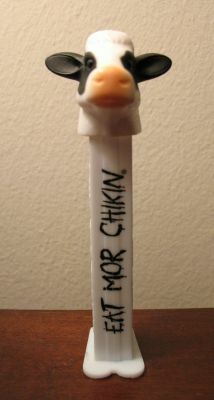 It is a cow, with the famous slogan "Eat Mor Chikin" on the stem. Pretty cool! Much like Christopher Walken, my fan worship of all things Batman is now forever intertwined with that of Pez. For the past few years I have made it a goal to collect every stem, head, and color variation of Batman Pez that I can find, both loose and on card (if I really wanted to spend time, money, and space, I could go on a variation quest for many more of my dispensers, but I'm perfectly content just doing this for Batman). In recent months I have made several additions to my Batman Pez collection, including the new, nicely designed Batman set, along with the variation with Bat logo on its stem (available only in collector's sets). 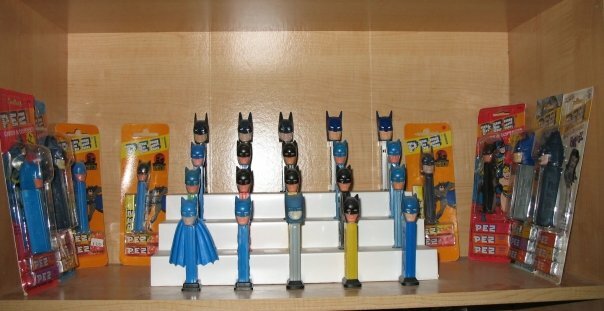 I've even dedicated a whole shelf of my Pez display to Batman Pez. Here is a picture of all my Batman Pez to date (excluding a custom one I got at Pezamania 18, which is hanging out with Walken Pez on another shelf). Notice the softhead Batman front and center, as well as the factory error Batman on a Bratz card (which I have affectionally termed "Bratzman").